I think a lot of the hate for this camera can really be attributed to Nikon's ad campaign for it, specifically the whole "pure photography" slogan. I'm just guessing, and naturally I can only speak for myself, but when I saw the ads and the blurry/dark images of the camera itself, I assumed that it was going to be a full frame camera, "dumbed-down" in order to provide an even more affordable full frame camera that had everything you "need" (here, I'm associating "need" and "dumbed-down" with "pure"). This made sense to me. No, you don't get video. No you don't get built-in HDR. No, you don't get a fast burst rate or a ton of auto-focus points or a super quick flash sync, etc. And then price that at $200-$300 cheaper than the d610. This would make it just ever-so-slightly more easy for people to get into full frame (which would make current and future Nikon owners happy), and you'd have people forking out $1500 on a camera because it's just slightly better than the d7100 they were going to buy. Also, it creates an opportunity a few years later for people with that camera, who have the bug to upgrade, to spend more money next time to get one just a bit better. We can all probably agree that photography is an expensive hobby (not necessarily unjustifiably so). We can all probably agree that it's hard to get by sometimes with what you have (e.g. trying to do wildlife photography with an 18-55 kit lens). We can all also probably agree that the feeling of not being able to execute a creative vision because of financial and/or technological constraints is pretty damn frustrating. I thought this camera was going to try and mitigate these issues by providing an affordable device that people want because they need it. 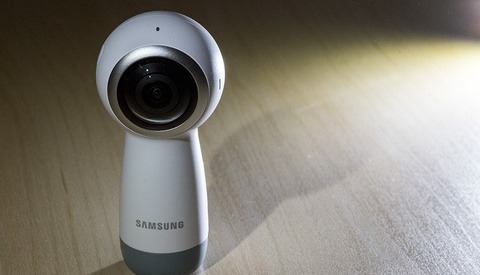 The official release of this camera absolutely destroyed that suspicion and that hope, and I think that it's why it received so much hate. It makes me feel like a parent--I'm not mad, I'm just disappointed. Personally, I think the ads are great, but dated in concept for the age groups they're trying to attract. If you look at this body design and what they appear to be attempting... It hauls back to the early to mid eighties with the FM(2) - FG days of shooting.. And lets just face the facts. A large part of us doing shooting back then have already long established our equipment roster and loyalties. We are who we are.. So where does the 'look' come into play? With guys that weren't even a stain on the mattress yet thinking.... they're stepping into that era by way of looks, the ideals and simplicity of what making images used to be about.. THE IMAGE. Today's websites are much more apt to cater to the 'latest &amp; greatest' crowds and what can we makeup and shove out there now mindsets.. We had 8 common films, we spent hours and hours perfecting temps and concentrations in a darkroom. We settled for pushed ISO's and grain.. Most of us had just one body.. So, I get the idea of whats being marketed here, and it's a nice thought. I miss the days of lab work and simplicity.. But all of those people for the most part are long gone and certainly set in their ways. This is just a look back for all of us old guys. And putting a old cover on a new pig, that just makes it a new pig with an old cover... And the new guy holding it; Well, I'm kinda speechless............. It will never be the 80's again. Love it or hate it the DF is getting lots of press for Nikon. At the end of the day does it really matter what camera you use. If you are not a pro like me and have limited cash then this is not going to be the camera for me. Just like cars we get what we like / have the budget for. My point is that it's easy to geek out on gear but when the average person is captivated by a great photo there first question is not what camera was that taken with. So if you like what the Df. offers then get one if not use what you like. I still soot my old D90 but looking to switch the a Fuji Film X-E2. I really like what Fuji is doing and it fits my budget. Okay, I still use film SLRs. Why? Because my Canon A-1 still works after 30+ years. I will buy a DSLR eventually, but Nikon and Canon are in an "arms race" introducing new camera models on a monthly or quarterly basis. It's difficult to choose a camera when the selections changes so rapidly. I don't know about the ergonomics of moving the ISO and exposure compensation to a manual dial, because on my A-1 and recently bought F-1N, there are interlocks that require 2 fingers to change. Most of the time, my A-1 is on [P], but depending on the situation, I will put it on [Tv], or [Av]. Yes, I've used [Av] to photography an evening baseball game; I set the aperture for wide open and let it decide the shutter speed. I've even used manual for moon photography and for panoramas. Some photographers are Canon; others are Nikon. It's like the classic Chevy vs Ford debate. The nostalgia look of cars is dead, except for the VW Beetle and the Fiat 500. I bought a Chevy HHR a few years ago because 1) I like the look, 2) it's practical for our normal cargo requirements, and 3) it has great fuel economy. I know that I will experience a culture shock when I use my first DSLR, letting it do everything for me, from focusing to choosing the ISO and white balance. The ads maybe were too good and kind of promised something, which Nikon Df is not. Where is the pure photography? Few more wheels and silver finish? Nikon missed the opportunity to introduce something really cool, maybe revolutionary, real game changer. I am trying to understand why NIKON doesn't get the US market. Why the heck would you work on this type of camera instead of a D300S replacement? In all of the blogs I have been reading, Nikon users, especially sports and bird watching photographers who cant afford a D4 camera, have been begging for Nikon to release a 16-24mp DX ProStyle body that has 8-10fps and better NR! Why is that so difficult to create? Why come out with a nostalgic camera that only a few enthusiasts are going to even think about purchasing? What a waste of the engineers time! 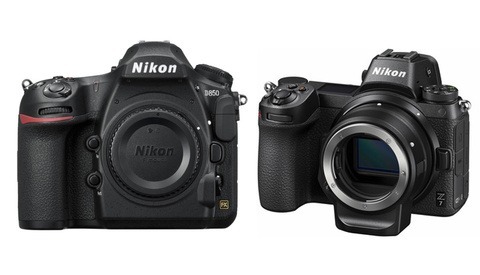 I have a D300S and a D800 and want to stay with Nikon, but they are making it very difficult! I can't afford to purchase a new camera body just because it's fun, and is a gift to myself. But I do admire Nikon's efforts in creating the new camera, and understand now what it's intention is. I like it. I would trade my D800 for it. i just hope it has an intervalomenter in it. Many moons ago, 1964 to be exact, I bought my first Nikon, a plain prism F with a 105mm f2.5 lens. Meter prisms were for wimps and I had a perfectly good Weston V for exposure readings. When I went to purchase it, I went along with Graham, one of the other assistants where I worked at Martin Mandel Studios, Baker Street. The thing is, that back then, there was no hype about cameras. Sure, some were more expensive than others because of the quality of engineering. Amongst pros who might use 35mm, Leica or Nikon were the cameras of choice. Most news photographers were still using Rolleiflexes. Canon hadn't entered the frame, it was just a name you saw on photocopiers that were always breaking down. The camera was no big deal, only the price was remarkable. £184 which would have bought a decent 2nd hand car or a genuine Fender Stratocaster. Upon arriving back at the studio, the boxes were discarded and the camera and lens placed in my mock leather camera bag along with my 6x6 Yashica Mat and a few rolls of film. I felt the same satisfaction I might have had from buying an electric drill or a decent saw. Cameras weren’t seen as objects of desire but as a tool to get the most out of 35mm film. The quality of a lens was considered far more important than what it was attached to. Within a few days I was taking pictures with it. Racehorses coupled with leggy models. Take an exposure reading, set the shutter speed high enough to freeze the action and set the aperture accordingly. Focus manually and that was it. The rest of the magic happened in the darkroom. We achieved quality through craft, particularly printing skill, which was to stand me in high esteem later in my career. The picture was what it was all about. No one cared what camera was used and few asked. What lens maybe, 28mm or 35mm, but that was as far as the technical interest went. The only thing that mattered was the result. I wouldn't mind betting that half the photographers who gripe about this of that feature out of many hundred available on any camera today, have hardly got any photographs worth a mention, having only achieved the level of a first year student, with tired, boring and not technically brilliant photographs. Worrying about camera features is the last thing they need to consider, simple lighting and mastering the digital darkroom is where they should be as at least 50% of a picture’s worth is in the final technical quality, which makes the wow factor that is subtly perceived. This is the DSLR I've been waiting for. I bought a Fuji X-pro1 for the same reason I ordered a Nikon Df: I really enjoying using the camera, and, for me, that makes me more excited about taking photos. I grew up using a Nikon Ftn and a Leica M2. Personally, I love dials, it was the way I was trained and I find it simple, intuitive and straightforward— this may not be for everyone. My Fuji gives me that Lecia feel with all the great innovations of digital. Now I will have a DSLR to match. When I was in the military all the combat photographers used a Nikon F and a Leica : Nikon for telephoto, Leica for wide angle. I plan to use the Df with my 85mm and I use my Fuji with a 23 (35)mm. With these two I can handle pretty much anything— and really enjoy the cameras and the process. really love using my Fuji, and I know I will feel the same with this Nikon. Hello everyone. First of all, I need to apologize for the long comment but I promise it's with the intention of providing (hopefully) constructive criticism. I hope Nikon and other camera manufacturers will take notice. So please stick with me. 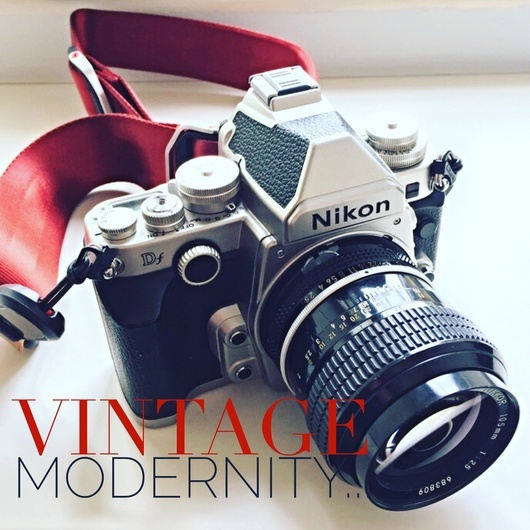 I think this camera is beautiful with great craftsmanship, that it would be good for travel, street photography or just for the pleasure of taking good picture and I agree that it will probably satisfy the nostalgia of some photographers who started out with Nikon film camera. Yes, after all is said and done: photography is all about THE FINAL IMAGE. I certainly appreciate good, beautifully executed craftsmanship and I believe a good camera is the one that serves to create the best possible image while integrating seamlessly in that process. However this is not achieved by simply having manual dials and a "retro look" which seems to be "in" right now but that's only just form over function. Spending the past 4 years (or so) developing this camera is somewhat a waste of time, resource, energy and focus. This camera has nothing revolutionary about it and showcases a lack of vision and the wrong priority for Nikon to pursue. Rather than spending 4 years trying to snap a Nikon FM top on a D600/D800 body, a better focus/priority for Nikon (and other manufacturers) would be to better integrate the technological advances available today into their cameras that would improve the image making process (or at least not get in its way). Per example here are 5 points that I think deserve to be high on Nikon's priorities. The D4 (and I'm sure Df), D800 and D600 are amazing cameras not just for their low light capabilities but also for their image quality and dynamic range. Nikon has also compared the images coming from the D800 to Medium format (and I think it's safe to say that even those who were naysayers when the D800 was first announced can now say this camera is definitely a breakthrough for Nikon), then why not provide a more full fledged solution? Why not bring 16 bit image processing to DSLRs and improve the resolving power of their current lens lineup? I'm sure a lot of Medium Format photographers would have no hesitation pulling their D800 instead under certain conditions knowing that image quality (as far as color accuracy especially skin tone reproduction) would be as good if not better than their MF cameras (not to mention the weight and ergonomics of the DSLR). What good are low light capabilities if your camera has a hard time focusing? So Nikon needs to improve the low light focusing capability of their cameras while not necessarily adding more focus points (I think 51 focus points are more than enough) but rather spreading those focus points more throughout the image area instead of having them all tightly packed in the center of the frame like on the D600. Also an improved focus screen with focus peaking or split image focus confirmation (for manual focus like on old film cameras or the Fuji X100s) would definitely improve a camera's usability in nailing focus. And no i'm not suggesting to completely drop optical viewfinders in favor of an all electronic one: I love my optical viewfinder. It's absurd that today, DSLRs are still stuck at an X-Sync speed of 1/250 of a second (even less on some models). I don't wanna have to worry about time of day, sync speed or HAVING TO gang multiple speedlights together (in FP high speed sync) to have enough power and fast recycling time when I wanna shoot wide open while also combatting bright sunny conditions. Why not build leaf shutters or some sort of electronic shutters into every new DSLRs while also adding some built in neutral density capabilities similar to the fuji X100s? I think David Hobby has been screaming this from the top of his lungs quite enough now: faster sync speed virtually increases the effective power and usability of speedlights or any strobe for that matter. I LOVE Nikon's CLS system mainly the ability to control every speedlight from camera position. I think in it's time, it was truly revolutionary but it's long (too long) overdue for an update. Joe McNally does wonders with it, but It's ridiculous that this system still relies on line of sight. In fact at times Joe has had to use some contraption like attaching 2 or more SC-28 cables together to get his master speedlight off camera so the remote speedlights could see it. Canon has already updated their speedlights with radio transmission. Pocket Wizard, Phottix, Radio Popper and other manufacturers have already demonstrated the ability to transfer Nikon's triggering signal over radio triggers, WHY oh WHY is Nikon still numb on this subject? Even some Chinese company named Godox has developed a bare bulb 300 watt/second (Sunpack 120J style) manual speedlight with remote power adjustment over radio (all with High Speed Sync to boot). I consider that an advancement. And while we're at it, it's time that the CLS system be updated to more than just 3 groups (the Godox flash mentioned above has 16 groups). Why not completely integrate GPS (useful for location scouting and file cataloguing based on place) and WiFi (for full wireless tethered capture) into every camera (professional or otherwise)? I don't mean the dumb down version available with the WU-1a/WU-1b adapters or the expansive option available for the D4. Every smartphone today has WiFi and GPS built in (as standard equipment), why can't a (big) camera at least allow me to take an iPad on an outdoor shoot (especially now that the new iPad air has desktop class 64 bit processor) and have my clients and art director follow along on their own iPads (or any other tablets) without me being first tethered to a laptop via a wire? A tether cable increases the risk of accident (amongst other inconvenience) not to mention all the additional abuse/hazard a location shoot can subject your laptop to including water, excessive dust, etc. Besides, taking a laptop on location also involves bringing additional (heavy) grip equipment to support it. By now I thought Nikon with such a beautiful system as the CLS would've thought about producing more than just 50 Watt/second speedlights. Sincerely, I thought they would've come up with some sort of Monolight already. I tip my hat to PROFOTO for their new B1 (though I wish it was less than $2000 a pop). Seriously Nikon?!?!?! And if I may add one more thing: impeccable quality control should definitely top the list cuz its unacceptable that an otherwise great camera be plagued by a flaw that could've been caught on time with good Q C. I'm talking about the D600. What's worse is Nikon being silent about it for a long time and suggesting that merely cleaning it should resolve the issue only to release the D610 a year later (which is what the D600 should've been in the first place). So those are just a few quick ideas I think should really be no brainers of a priority for Nikon. I'm sure other photographers will contribute to that list. I get the whole this is a camera to "grow yourself" or for personal shooting. That is exactly why I would want one as that is the only shooting I do. With that said, the price is still too high. I am personally lusting after the DF. I have looked at the D4 which is more than I need but suits what I do better than the 800 or 610. And, now there is a D4 in a cool body with amazing low light capablity, I have my SB400 so fill flash is not an issue, I don't care about video, can carry extra cards. Im so happy that I dont have to explain why I like the Nikon Df. 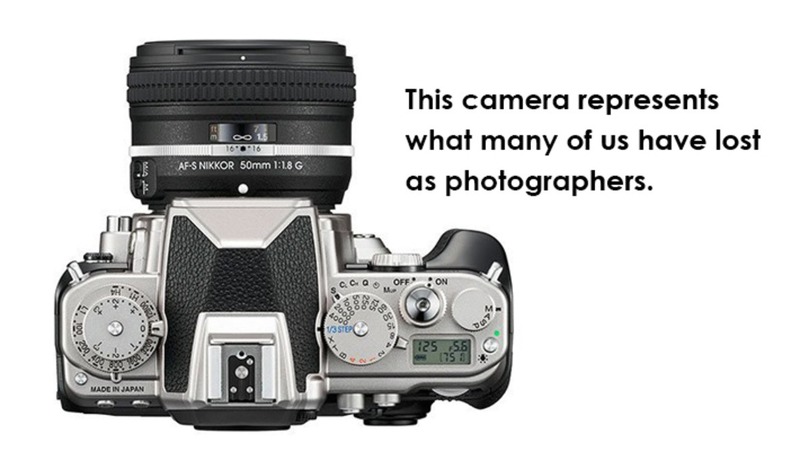 It's truly amazing that people who dont like this camera use so much time and effort to explain just that. My last Nikon film SLR was the F3, before my jump to the D70, D700, and on to a later DSLRs, and as a manual shooter, I found myself missing the left hand support camera/aperture, right hand light grip, shutter and speed, without taking the finger off the shutter. I recently purchased a fuji XT1, for my light weight city/running camera, and the return to this mode of shooting brought back memories of the practicality of shooting with the F3 I was teaching a night photography class, and found the Fuji really hard to use at night, and got me thinking of the value of the DF with the super low light D4 sensor and ability to use my classic Nikkor manual lens, so,, with the current refurbished pricing going on, it was a nice addition. I think one begins to stop looking for the perfect camera, and like lens, over time,, fill in the niches. Photography is a long time endeavor that one can add gear over time. So, while I do not romanticize that this camera somehow brings back the magic of photography, I do value the ability to shoot old school stance, and the low light ability of this camera. Oh, and my biggest disappointment of the DF, is the modern ability to use the liveview to validate the exposure similar to my D800. This is the bi-product of having to use the 610 shutter / board for space savings. I have found that for water fall shots, this is an extremely useful feature, and also a way of getting some of the advantage of the electronic view finder like the Sony or Fuji, etc. So, thanks for posting an article that gets us talking about the qualities of the DF.. Your words about the Nikon Df cannot be more exact! 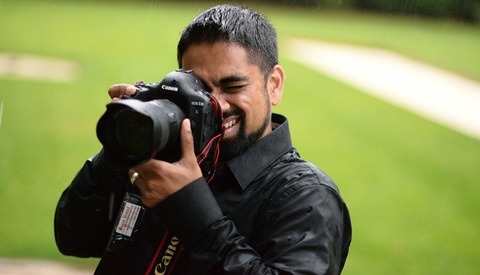 I own two big bodies (Nikon D3X and D3), old but trusted, and I use them to get my everyday job done... and done well! But using them for my walking around and travels, I slowly had lost the pleasure. Now, with my new (second-hand) Nikon Df, I got that pleasure back... and I couldn't find a better camera to do the job!